Come and vote in a committee which will represent and fight for you in the coming year. If you would like to become a member of the committee or a rep, please e-mail ucu@coventry.ac.uk or just come along on the day and get someone to nominate you. We welcome participation from all members. All members are welcome. New members can join on the door. This entry was posted in Uncategorized on October 26, 2018 by coventryucu. Last week The Guardian newspaper published a letter from UCU general secretary Sally Hunt – scroll down to the bottom if you haven’t yet read this. This letter made the point that public outrage about University leaders paying themselves outrageously high salaries is not the full story of what is happening in universities today. It also concerned the new terms and conditions staff working in these institutions are having to face. Sally singled out a CU Coventry (formerly Coventry University College) as an example of this. While this ‘no-frills’ provision is trumpeted by our Senior Leadership team as a “life shaped learning”, the lower costs for students at the College are entirely at the expense of staff, who are not covered by existing collective bargaining agreements, earn earn lower wages, work longer hours, have shorter marking turnaround times and are not allowed to join the Teachers Pension Scheme (being offered instead a scheme where the employer makes half the contributions). As we have argued, the whole purpose of these “wholly-owned subsidiaries” within the Coventry University Group is to drive down costs and create a surplus for the main University. What has this got to do with members of staff at the main University? The answer lies in the New Academic Year that the Deputy Vice Chancellor Ian Dunn has recently proposed (2/11/17). This asks you teach across three semesters for 13 weeks at a time, to halve your turnaround time for marking, to keep on top of the ballooning volume of administration, and maybe make some time for research as well. In other words having got away with creating mini institutions with lower pay and inferior conditions, the plan is now to make the university more like the subsidiaries. While the New Academic Year plan has been delayed for a year – reality had to bite somewhere – the plan is still to proceed with this no matter what the cost to your well-being, to the student experience, or to the quality of the teaching and learning on which our reputation is based. Indeed the long term game plan was expressed by Ian Dunn, deputy vice chancellor for student experience, in The Guardian (5 December, ‘U-turn on two-year degrees predicted as fears grow over funding’) when he said the main university would be keen to introduce two-year degrees on its bigger courses if higher fees were brought in. Our deputy VC qualifies this statement with a recognition that not all students would want to study on accelerated degrees, however, we would argue that any introduction of 2 year degree within the main University – and the massive restructuring such changes would require – will push the university staff and systems to breaking point. They will not raise the quality of education at Coventry University – this will be cheapened. As is the habit of University management, the Academic Year plan was announced in an email with absolutely no consultation with the recognised trade unions, staff or students. It is for this reason that UCU, alongside the other two recognised unions Unison and Unite, have called on the management not to proceed with these plans without thinking about the impact they will have on staff and to consult with those recognised trade unions. We are taking this stance because we are already aware of the stress staff are under fulfilling existing demands. We want Coventry University to be a place where staff who work very hard and care about the quality of education our students receive are listened to and consulted on changes that affect our working lives. More than ever, we need our recognised trade unions to remind our disconnected leadership team what is going on. Your article on university attitudes to accelerated degrees (U-turn on two-year degrees predicted as fears grow over funding, 5 December) makes reference to Coventry University College’s “no frills” educational offer. Let’s be clear about what “no frills” actually means in this context. Coventry University College, or CU Coventry, as it’s now called, charges lower prices for its three-year degrees and claims to offer students a more flexible experience. But if you teach at CU Coventry – a subsidiary of Coventry University – “no frills” means you get paid much less than your colleagues at the university, your teaching year is much longer, your workload heavier, and you have no access to a decent occupational pension. About 40% of the teachers are paid by the hour and this “sweating of the assets” means there is a heavy turnover of staff. All of which helps to explain why these teachers are fighting hard for a union. Their colleagues at Coventry University can be in a number of unions that are recognised by the university. Appallingly though, the board of governors at CU Coventry decided recently to resist any approaches from unions at the college. CU Coventry’s “no frills” model is highly profitable. In 2016 it registered post-tax profits of £3.8m which it then gift-aided to its sole shareholder, Coventry University. The CEO of CU College is the pro-vice-chancellor of Coventry University and the board includes two deputy vice-chancellors and the university secretary. The university sector is currently beset by scandals over senior pay and perks, and it is right that a light is finally being shone on the murky world of remuneration committees. It is also time to take a proper look at the role of subsidiary companies and how they treat their staff. This entry was posted in Uncategorized on December 20, 2017 by coventryucu. Financial risk – the corporate plan aims to invest ‘at least £350m, with a surplus every year of 7% of income’ – the total net assets of the whole University Group are only £251m. We are concerned that if the bottom falls out of the aggressive growth plan the University has been pursuing, if student numbers fall significantly for example, it will be our members, our colleagues and our community in Coventry that will bear the consequences. Housing crisis – The Corporate Plan seeks to increase student numbers across the Group to an eye watering 80,000. According to HESA data, there were 27,600 HE students at Coventry University in 2014/15. The Corporate Plan, therefore, seeks to almost triple student numbers across the group. Coventry is already suffering a housing crisis, and the student accommodation being built now to accommodate these students doesn’t even scratch the surface. Tensions are rising in the city, with residents having mixed feelings towards the two universities, which they feel to be increasingly taking over. Equality – We have one of the most extensive and active equalities committees in UCU, and since the start of 2016 Coventry UCU equalities reps have made numerous representations for information, support and adjustments in order to support the rights and interests of our members. This new edition of the pamphlet describes this work and outlines our vision for a fairer university in our ‘Equalities Charter’. We launched the pamphlet at the end of the last academic year (2016/17) at one of our best attended meetings, with about 100 members coming to collect their physical copy, have a samosa and listen to Stephen Cowden (Coventry UCU chair), Jane Nellist (Coventry TUC president) and Douglas Chalmers (UCU vice president) speak to the issues raised by our intervention. In the new academic year we will be building on this success by pushing forward with our key campaigns, engaging in our day-to-day equalities and case-work activities, as well as pushing forward with new campaigns, Come along to our Annual General Meeting in Oct (details tbc) to hear more. This entry was posted in Uncategorized on August 6, 2017 by coventryucu. Coventry University UCU expresses its solidarity with our colleagues in Warwick UCU in its ‘Save Our Statue’ Campaign. This campaign concerns the way the University Management at Warwick are currently seeking to remove Warwick University’s ‘statute reforms’; which involves the repealing of current provisions for redundancy, discipline and dismissal. These changes makes it quicker and easier to sack and discipline members of staff at the University. This entry was posted in Uncategorized on June 1, 2017 by coventryucu. On the 22nd February 2017, Coventry UCU were honored to have co-organised a screening of I Daniel Blake with Unite Community (Coventry and Warwickshire Branch) along with supporting organisations Peoples Assembly and Coventry Recovery Centre. Our aim was to raise awareness of the sanctions regime in the benefits system and to highlight the desperation and indignity that this imposes on thousands of people in Britain today. After the film there was a question and answer session in the theatre led by the director of the film Ken Loach, which was a huge success and enabled some very important issues to be raised and discussed. The Q & A was filmed and we hope to be able to put on another screening for those who didn’t manage to get a ticket with a screening of the Q & A later this year. Thanks to everyone who came and made this event a success. This entry was posted in Uncategorized on February 23, 2017 by coventryucu. Do you know how democracy works in UCU? Would you like to get involved in setting local and national policy? Only members can vote, but all welcome! This year we are trying out a new experiment. 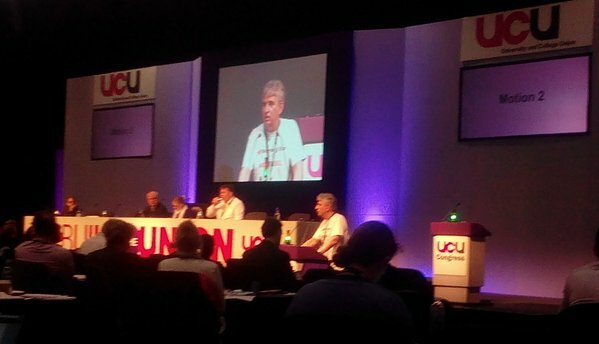 We are holding a ‘mini congress’, which will imitate the national UCU congress, and inform our policy for the next year. Successful motions will also be sent to national congress, and if you submit a successful motion, you could have the opportunity to move that motion at national congress. Motions are statements asking for specific actions from the union. Branches, regions, the NEC and other national committees can all bring motions to congress, where votes take place on whether they are to be used as policy. These cover a wide variety of areas. You can have a look at last year’s motions at https://www.ucu.org.uk/congress2016 to find out about how they are put together and please get in touch with us at ucu@coventry.ac.uk if you would like any further help. Conference notes that the 2015 green paper suggests (part C, chapter 3, pp. 66-68) that Higher Education Corporations (HECs) should in future have the right to dissolve themselves into for-profit providers. Conference also notes that providers such as Coventry University are already taking over large sections of their city/town centres and thereby increasing their asset portfolios. Conference is aware that such developments could lead to the privatisation of publicly-owned spaces and that such assets will be extremely attractive to ‘corporate raiders’ such as hedge-funds. Such privatisation could therefore lead to the asset-stripping of town and city centres for the purposes of shareholder super-profits. to commit existing higher education providers to place the public good above private profit and in the process democratise institutional governance. This entry was posted in Uncategorized on January 22, 2017 by coventryucu.